Rochester, N.Y., September 07 -- To meet the demands of today’s mobile consumers and connected professionals, Kodak introduced a new line of KODAK HERO All-in-One Printers allowing people to print how, where and when they want. The HERO Printers are Google Cloud PrintTM Ready and KODAK Email Print Ready, letting consumers easily send documents and photos to their printer from anywhere in the world, using anyInternet-connected device. They represent the latest innovation in the company’s consumer inkjet portfolio, marrying effortless connectivity with Kodak’s unique combination of high quality output and affordable ink. In addition, Kodak will enable Google Cloud Print and KODAK Email Print for previous generation KODAK All-in-One Printers, making Kodak the first printer manufacturer to also offer cloud printing for its existing customers. Available this month, Kodak has added four newly-designed printers to its portfolio for the home: the HERO 3.1, HERO 5.1, HERO 7.1 and HERO 9.1 All-in-One Printers. 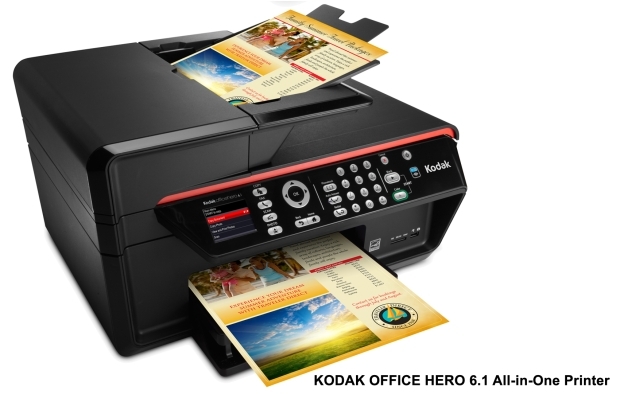 For the home office, Kodak is introducing the KODAK OFFICE HERO 6.1 All-in-One Printer. New this fall, KODAK HERO All-in-One Printers let consumers seamlessly print on the go from their smartphone, laptop or tablet using Google Cloud Print-enabled apps such as Gmail and Google Docs. They can also send emails and attachments to their KODAK Printer from anywhere, using any email account, with KODAK Email Print Service. Consumers can even share their printer’s unique email address with friends, family, colleagues and clients to receive printed files or photos. In addition to cloud printing capabilities, with the KODAK Pic Flick App, consumers can print photos directly from an iPhone, iPod touch, iPad, BLACKBERRY or ANDROID OS Device3. And with Kodak’s fast Wi-Fi set-up, it’s easy to connect to a home network. The world’s foremost imaging innovator, Kodak offers premium photo and document quality backed by more than 100 years of leading KODAK Image Science. KODAK All-in-One Printers with Kodak’s proprietary pigment-based inks deliver crisp, sharp text documents, brilliant graphics and KODAK Lab-Quality Photos that dry instantly, are smudge, water and fade resistant, and last a lifetime. Kodak offers the world’s fastest photo speed printing for highest-quality prints. Committed to providing customers great value, Kodak offers the lowest total ink replacement cost and exceptional cost-per-page. KODAK All-in-One Printers feature built-in intelligence, such as Kodak’s Smart Sensor technology that predicts the supplies and time needed to complete a job, and automatically identifies paper, size and amount, to help consumers save time and get more done easily. Consumers can also send scans directly to Google Docs, email, memory cards, USB flash drives and network folders. 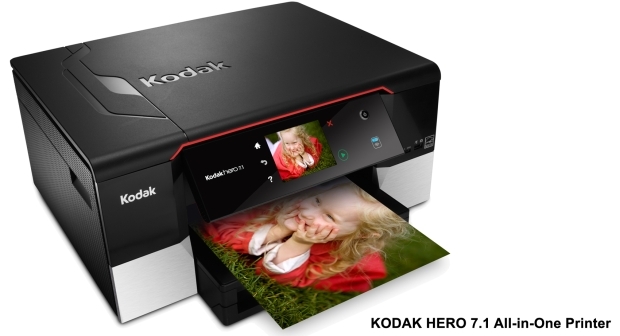 Kodak is also introducing a touchscreen display with its HERO 7.1 and HERO 9.1 Printers, and more automated features with the OFFICE HERO 6.1 Printer including automatic two-sided printing, copying, scanning and faxing. Included with every KODAK Printer is KODAK All-in-One Printer Home Center Software, featuring Kodak’s Perfect Page Technology which corrects and improves scanned images so they are sharper than the originals. Kodak’s software allows consumers to do more with their photos, including 3D photo printing, printing scenes from video files, as well as photo printing directly from FACEBOOK, KODAK Gallery, PICASA, FLICKR and PHOTOBUCKET sites. For more information on Kodak’s inkjet printer portfolio and inks, visit http://www.intelligentprinting.kodak.com.